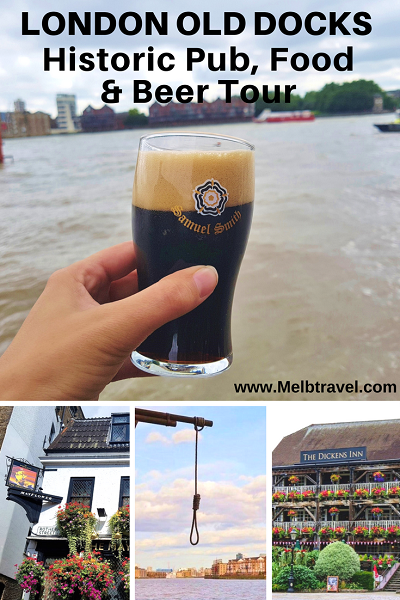 When the opportunity came up to go on the new London Old Docks – Historic Pub, Food & Beer Tour run by Eating London Tours, I jumped at the chance. Especially because I had such a great time on their previous tour Twilight Soho Food and Cocktail Tour. 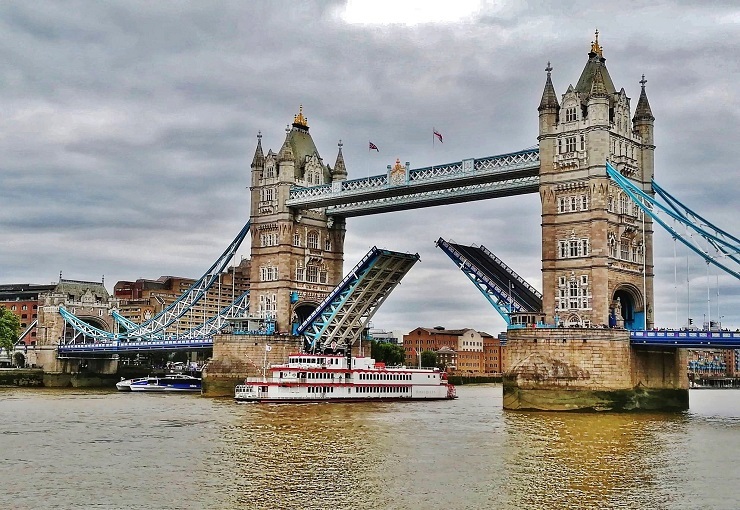 The London Old Docks – Historic Pubs, Food & Beer Tour allows you to discover some of the oldest and most historically significant pubs located along the docks, which was known as old London town. Back in the day, these pubs played an important role in the lives of sailors, dockers, and even pirates – a place where they met, intermingled, ate and drank. More than hundreds of years old, they now hold the testimony of the eras gone by. Once a busy trading port, today this area is relatively more peaceful and offers serene and awe-inspiring riverside views of the city. 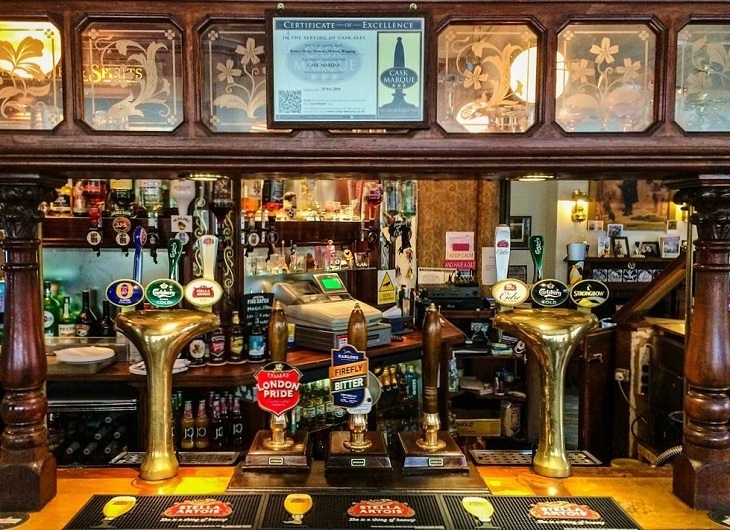 As you visit these historic pubs, you will be able to picture in your mind’s eye the lives lived and the stories told! That’s not all. 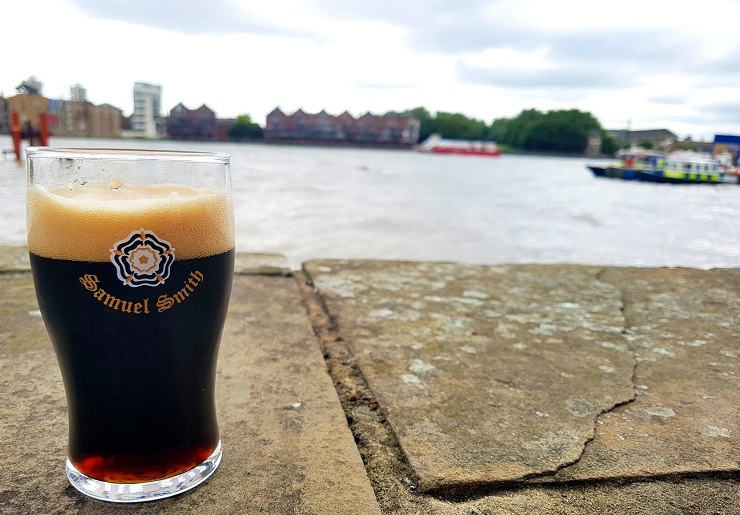 On this unique tour, you will also get to enjoy some of the finest brews that London has to offer along with a wonderful line-up of lip-smacking food that will surely tickle your taste buds and make the experience of re-visiting an old-time pub all the more realistic. The Historical Pubs, Food and Beer Tour will leave you feeling suitably entertained with memories to cherish for years to come. 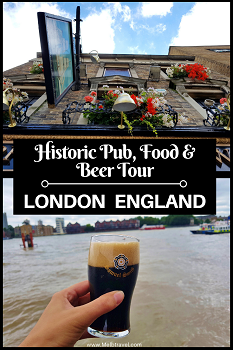 One of the things I loved on The London Old Docks – Historic Pubs, Food & Beer Tour was the variety of the 5 pubs. All were old and historic in some way, but they each had their differences and stories to tell. The first stop on the tour and only a 2 minute walk away from the meeting point is the famous Mayflower (or once known as the Ship). It is a charming little pub with baskets of fresh flowers hanging all over the facade. It is considered to be one of the oldest watering holes in London, rich in history and culture. Inside, the walls are covered in shipping memorabilia and they even have a log book for ancestry of the sailors and pilgrims who stayed on the Mayflower ship. 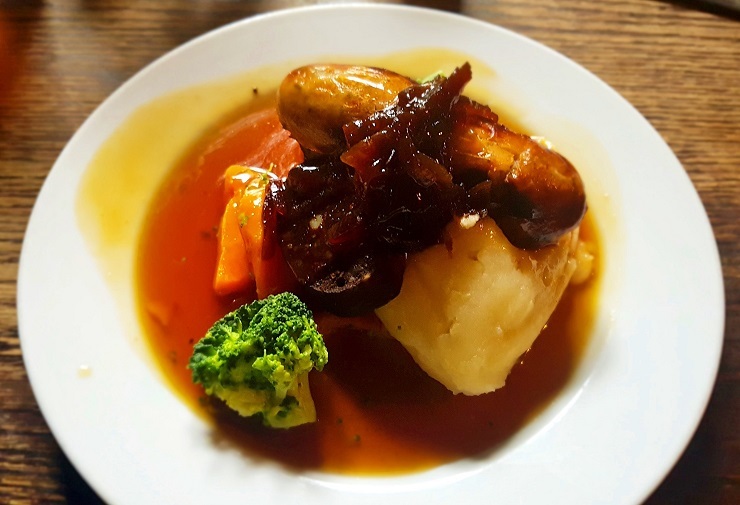 Here you will be served an English classic of bangers and mash with black pudding and gravy. You will wash this down with a scurvy ale while learning about how The Mayflower became one of most historic pubs in the UK and how it played a very important part in American history in 1620. Today, from the rear of the pub you can still see the original mooring spot of this famous ship. Built in 1520, The Prospect of Whitby (originally known as The Pelican) is believed to be the oldest tavern on the Thames. 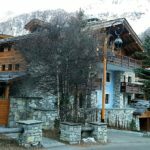 As soon as you step inside, you will feel like you have taken a step back in time, the floor is the original flagstone dating back some 500 years (even with the original door trap that is now sealed off). There is a rear deck that overlooks the former execution docks, complete with replica gallows and loads of interesting memorabilia. We sit for our 2nd classic British meal Fish and chips with mushy peas, washed down with a craft ale. As we listen to our guide, the first thing that comes to my mind is the phrase ‘If these walls could talk” they would tell you a story. The stories seem never ending, from the pirates to the cruel executions served by hanging judge Judge Jerries. Turner’s Old Star looks exactly like you would picture a typical English pub. It is one of the last remaining traditional East End pubs that is independently owned. Renamed after the famous artist Joseph Turner, who was inspired by the docks and the ships that frequented the waterways. Today the pub is used in many movies (most recently Legend starring Tom Hardy) and is famous in its own right. Once you step in you are greeted by the owner (Bernice), who will pour you a London favourite ‘London Pride’ (I had a cider, no more beer for me) and give you a home made steak pie. As you may know, I am Australian and we love meat pies, even when we are full. If you have time, take a wander and look at the photos on the walls and see how many celebrities you can name. 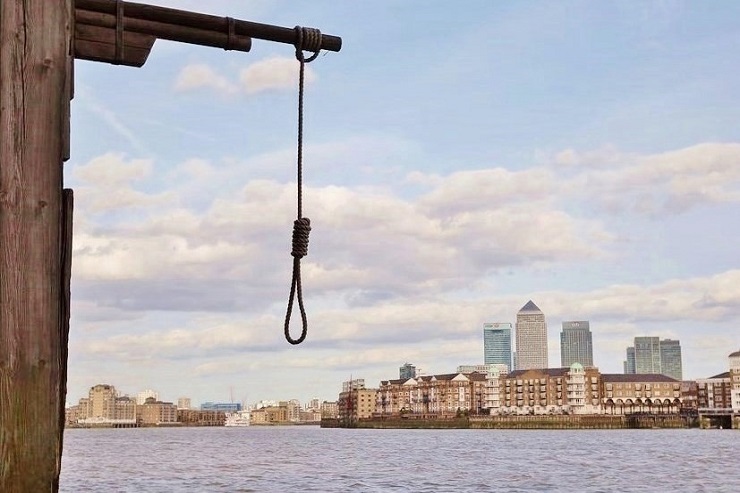 Named after a 17th-century pirate (William Kidd) who was executed in 1697 and built inside a former coffee warehouse on the river is Captain Kidd. Unlike the other pubs, it is spacious, has a huge beer garden and is more modern. In some ways, you can tell it is corporately owned with its own labelled beer and snacks that line the bar. In this case, though, it is Samuel Smith label that is used in this bar. Here instead of an English classic meal (you’ll need a break after all the yummy food), you will enjoy a classic pub snack the ‘hairy snack’ while sipping on a porter. The porter had a strong smell and taste was definitely different from the ales. What better way to end the tour than at one of my favourite pubs in London, The Dickens Inn. Completely covered in fresh flowers, this former 18th-century three-storey warehouse with balconies definitely stands out. It has a long and intriguing history intertwined with Charles Dickens and East London heritage. When you look at the slant on the roofline, it is higher on one side than the other. You finish off with a delicious Cheese platter, dedicated to English cheese such as stilton and cheddar that was paired with a Symonds cider. A great way to end the tour after a fantastic time learning, eating and drinking. Stopping at Tobacco Dock, to see a replica of one of the trading ships coming from the West Indies that remains permanently docked. It is hard to believe that originally this area was large as 40 football fields. 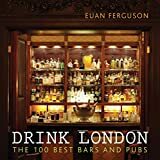 Visiting and learning about five of the most intriguing London pubs, which are must-visits for any discerning traveller. Walking along Wapping Wall, now a heritage protected street that was once a bustling hub of pubs and warehouses. It looks really cool how all the cranes are still in place, as part of the street decor. I love Eating Europe Food Tours concept behind their tours of discovering unique facts about a city through tasting different foods and experiencing and learning the culture. If you like the tour, the great news is that Eating Europe Food Tours also operates in Amsterdam, Florence, Prague, and Rome. 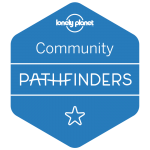 The best bit is they conduct a variety of well-designed and thoughtful Food Tours and Cooking Classes, depending on your interest. Which gives any food lovers and budding travellers a chance to explore some of Europe’s most beautiful and soulful cities through their food. There are a number of other tours that are currently held in London, I highly recommend the Twilight Soho Food and Cocktail Tour. I also, understand that the Brick Lane is really good especially if you like a good Curry. Don’t eat beforehand, as you get plenty of great English food on the tour to enjoy. You catch tube for one stop under the Thames. If you don’t have an Oyster card, don’t worry you can use your contactless. If you do not want to drink beer, then you can have cider or soft drink. Please let the tour know in advance. The food tour takes place in Rotherhithe/Wapping, a 2-minute walk from Rotherhithe Station. And finishes at The Dickens Inn in St Katharine’s Way and only 5 min walk to Tower Hill tube. Once you have purchased your ticket, London Food Tours will provide you with a map and easy to follow instructions for the meeting point. Time; Make sure to be at the meeting point at least 15minutes before hand. 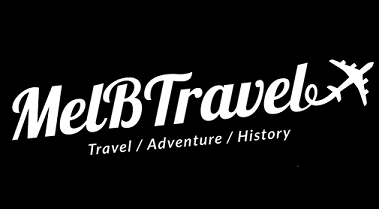 If you are interested in discovering more of England or History, feel free to read my following articles. All are great options for groups of friends or family, especially who love the outdoors. 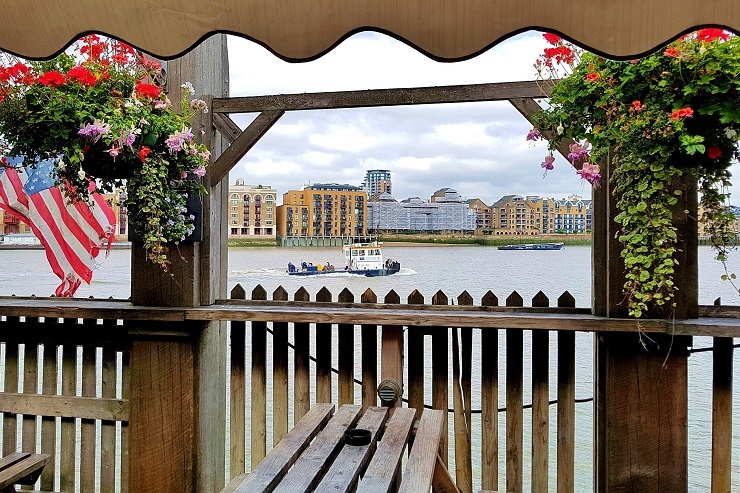 Thank you for reading this article, I hope it helped you in deciding to do the London Old Docks – Historic Pub, Food & Beer Tour. It is such an interesting tour. If you liked this post, please feel free to share! Disclaimer: Even though I was a guest of the London Food Tours All views are my own based on my own experience. I used to work in this area so I know it very well! The Prospect of Whitby and Captain Kidd are my favourites, they’re so traditional and rustic inside. Nice to see the Sam Smith glass of ale, it brings back good memories! You would definitely love this tour then, I live in London but I learn so much from the tour. I can’t believe how old these pubs actually are. I have played hangman a few times in my life. 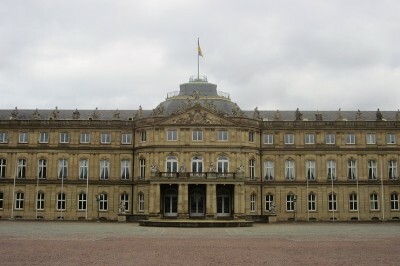 Definitely, recommond this tour, I learnt so much history on it. I have done a few of the Eating Europe Food Tours and they are great. I have learnt something on every single one. This looks like such a delicious tour! 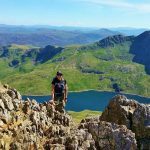 I love the idea of visiting numerous pubs and learning about their history!! I wish I had gone on a tour like this when I was last in london. Rather then stumbling around trying to find a decent pub! 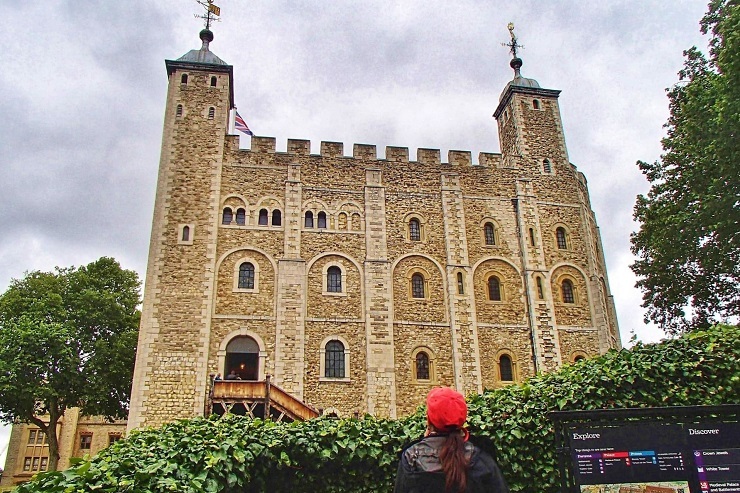 I live in London and I always struggle to find a tour that I can learn something new about the city. This is definitely a great tour, I loved walking around all the different pubs and learning something at the same time. 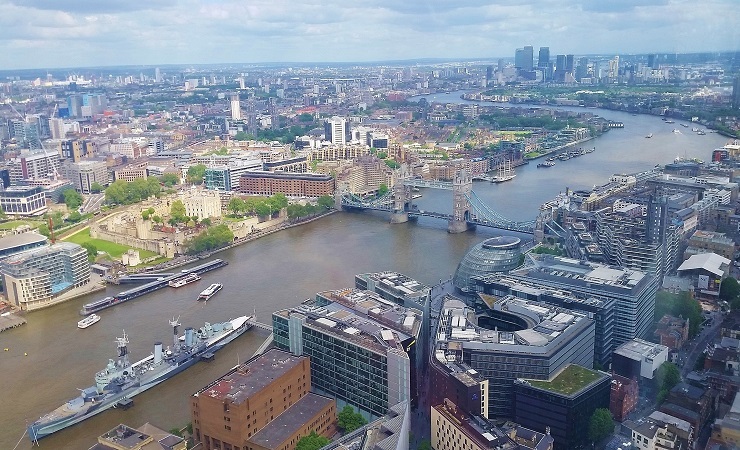 Admiring Thames from a vantage point would be just perfect. The replica on Tobacco Dock is really interesting. Moreover, I wish I could walk along Wapping Wall as I love exploring a city on foot. Cheers!! All these pubs were great and so different to the norm corp places that we have in central London. I never knew that they had so much history behind them. 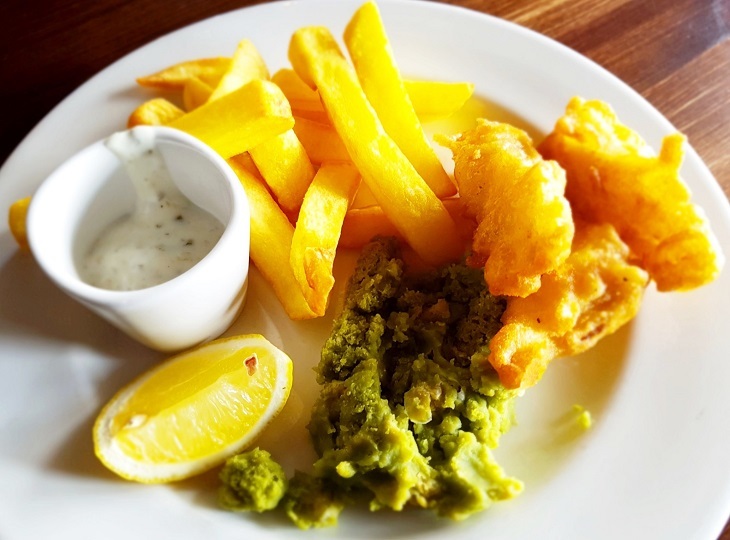 There is nothing more classic than Fish & Chips in London. I love that and would love to sample those as they look so yummy. I love the ambiance too – it definitely adds to the dining experience. We had lots of different English classic meals with cider and beer to wash it all down. I was so full afterwards but it was so good. I definitely recommend it or the Soho one as I have done both and I thought they were great. I have been to London a couple of times & I am always looking for new tours to do. I love history and beer and this sounds perfect to do next time I’m in town. Yes definitely add this to your list next time that you are in London, it is so worth doing for sure. This would be so neat to do! I love history, so this kind of tour would excite me. What great photos! I don’t like beer, but I’m all about pub food. This was definitely a fun tour, I know a lot about London already but to go on this and learn more was great. The pleasure of moseying around this London area would be ideal for this gal. The food, the views – all perfect! I definitely highly recommend it for sure. The flowers cascading on the walls of the Mayflower and The Dickens Inn are so breathtaking and so vibrant! I love visiting places that has a historical story to them and love the rustic look of these places. This would be my type of tour! It is a great tour and loved going to pubs having a drink and hearing all the stories. Wow sounds like a great tour. Especially as it involves food and drink. I need to see more of London and hopefully will do when I get home in a month or so. This is something I would love to do. I think my favourite photo of a pub has to be your favourite too, The Dickens Inn. How beautiful! It must have been amazing to participate in this historic beer tour. Nice to hear that the pubs were so different from each other. The Dickens Inn looks amazing! Would love to visit this pub one day! It is a really good tour. The Dickens Inn is one of my favourite pubs in London. Interesting, this seems to be a great tour and lovely pub to have some fav drinks and relax. 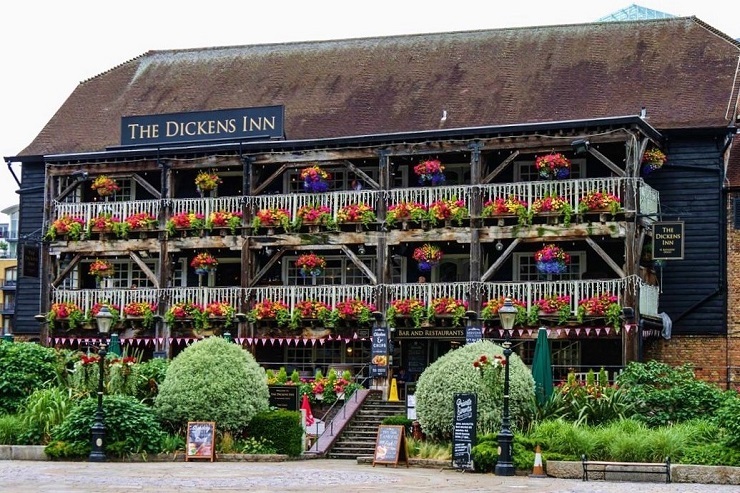 Dicken’s Inn seems to be lovely, shall try out when in London! Wow this trip looks incredible! Especially that food, omg!!! Hahaha, no but really, I would love to travel here. I’ve never been to London, but it’s on my list! Thanks for letting me live vicariously through you! You will have to come to London is a beautiful city full of interesting history. The food tours sound like a great idea! Thank you for sharing. 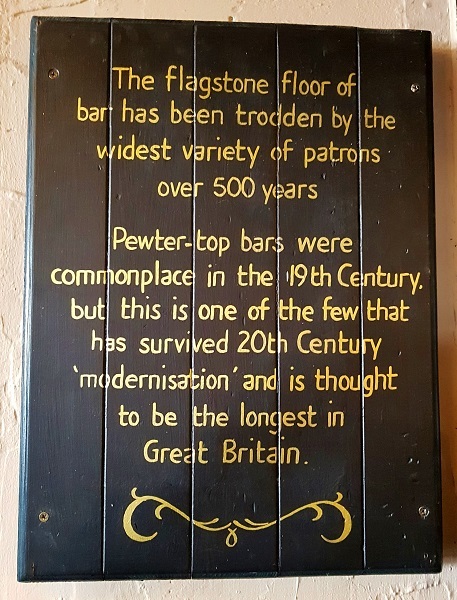 This historic pub tour sounds like so much fun! I love doing food tours and learning a bit of history in-between makes it so much better 🙂 That home made meat pie looks so so yummy and I’m sure it goes so well with the tasty brew. I was really surprised about all the information and that they all had so much history behind them. I would love to take this tour myself. I think you discovered some true gems there and I am really jealous! Yes, the company definitely found some great hidden gems. I’ve never been to London but I do have plans to travel there in the future. This food tour sounds like something that’s right up my alley. This tour looks awesome, The food tours sound like a great idea! Thank you for sharing. I’ve never even heard of this part of London. I’m visiting for the first time in May and I’m so excited! I’ve saved this for future reference. 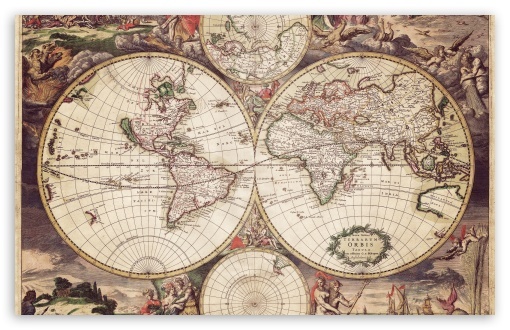 I love the idea of visiting where the Mayflower took off. I also find it interesting that it was known as ‘the ship’. Prospect of Whitby looks so charming. I’ll be going there as well! This is in central London so you won’t have to go far to do this tour. Have an amazing trip to London. 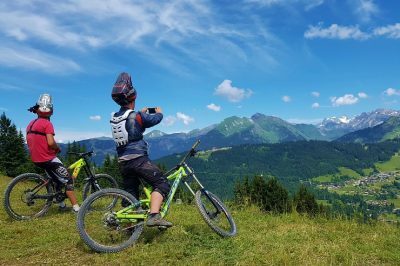 These are some great photos of this experience. I love the beer tour loooks like a lot of fun! 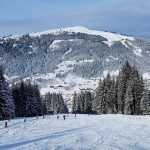 Great roundup of places! This made me fall all the more in love with London! It is a tour, so I will have to thank the organisers for the roundup. This looks like such a unique place to experience. Definitely full of character and history. This is most definitely my sort of guided tour! I especially love the Mayflower and had no idea that it’s one of the oldest bars in London! The views out back are excellent and I’d love to finally try black pudding! Looks and seems like a great place to spend some time. Excellent tour. Thank you for sharing. I highly recommend the tour it was a lot of fun. I feel like this is a very quintessential London thing to do. London has been calling my name and I think I’ll try to get back there for a week at some point this fall. What a cool tour! It’s great that people are showing UK food and drink off to its best. I love history and English pubs, so it was definitely a fun tour to do and I highly recommend it for sure.